Farhin Mehendi Artist Mumbai was started by Farrhin Khan whose a professional mehendi artist with 10 years of experience. They share their ideas with you for your big day, also take your preferences and give their best. Contact Farhin Mehendi Artist, Mumbai for their rates and more information. I block, Babu Ki Chawl, Near Old Masjid, Prem Nagar, Jogeshwari East, Mumbai 400 060. 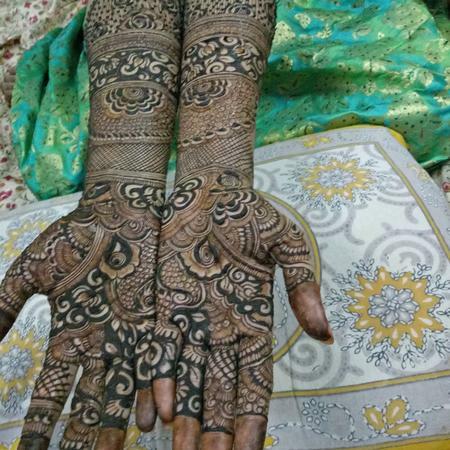 Farhin Mehendi Artist is a bridal mehndi artist based out of Mumbai . Farhin Mehendi Artist's telephone number is 76-66-77-88-99, address is I block, Babu Ki Chawl, Near Old Masjid, Prem Nagar, Jogeshwari East, Mumbai 400 060.. In terms of pricing Farhin Mehendi Artist offers various packages starting at Rs 5000/-. There are 0 albums here at Weddingz -- suggest you have a look. Call weddingz.in to book Farhin Mehendi Artist at guaranteed prices and with peace of mind.